With the ever-increasing pace of life & how hectic everything is, I decided it was really important to make my bedroom a very calm space - MY SANCTUARY. As you will know if you have been reading my blog or following me on instragram, I love colour, but in this room, I keep things a lot more muted. Grey, white & blush pink are calm, tranquil colours and this gorgeous wood effect wallpaper adds to that feeling of peace. I have to confess, the wallpaper was here when I bought the house, but when I redecorated earlier this year I chose exactly the same wallpaper as I really love it. It's from a company called Rockett St George and is part of their Engineer Collection, and whilst it's generally hung vertically the horizontal look is a perfect backdrop behind my bed. The bed, as you might now expect, is from Loaf. In scuffed grey, the Coco bed is the perfect complement to the colours in the room. The bed has a French style with a curved headboard and curvy, carved legs. I love the simple style and the linen fabric on the headboard is surprisingly hardwearing - I was worried it would get easily marked but it has been holding up very well so it's not something you need to be concerned about. The blush pink adds a pretty accent colour to the room - these are my favourite sheets. I have another set that are grey & white which look lovely too, but I love the warmth the blush pink brings. These are a lovely relaxed cotton from Loaf's Lazy Cotton range and I bought at the same time as the bed. New bed, new sheets. Right?? Finding the perfect bedside table took me ages. For months, I made do with some little stools by the bed as I didn't want to make a rush purchase and get it wrong. Plus, having really invested in the bed & mattress, I didn't want to spend too much money. Balancing quality & cost is always important and expensive doesn't necessarily mean better. I wanted something quite narrow with just a small amount of storage and space for the bedside essentials. Maison Du Monde is a great homeware website that has a really good range at reasonable prices and one evening I found these bedside tables that looked perfect. They arrived quickly, and when I took them out of the box, I was not disappointed. They fit perfectly. The curved features mirror the shape of the bedhead & legs so they look really good together. Anthropologie & Zara Home are great places to visit when looking for those little touches to finish a room off. Home Sense is pretty good too but, sadly, there isn't one near me at the moment. Maybe one day! If you are lucky enough to have one nearby, definitely check it out. I was browsing Zara Home in Richmond and pondering just how much it was acceptable to buy, when I found this carved wooden box. It's nice & solid without being too heavy and I use it for make-up, jewellery, all sorts. I like to be able to put things away so they're tidy (a little bit OCD but just a little) but still want storage to be pretty just like this. This coral & gold coaster is from Anthropologie, I'm afraid it's sold out but you can get a similar one here. 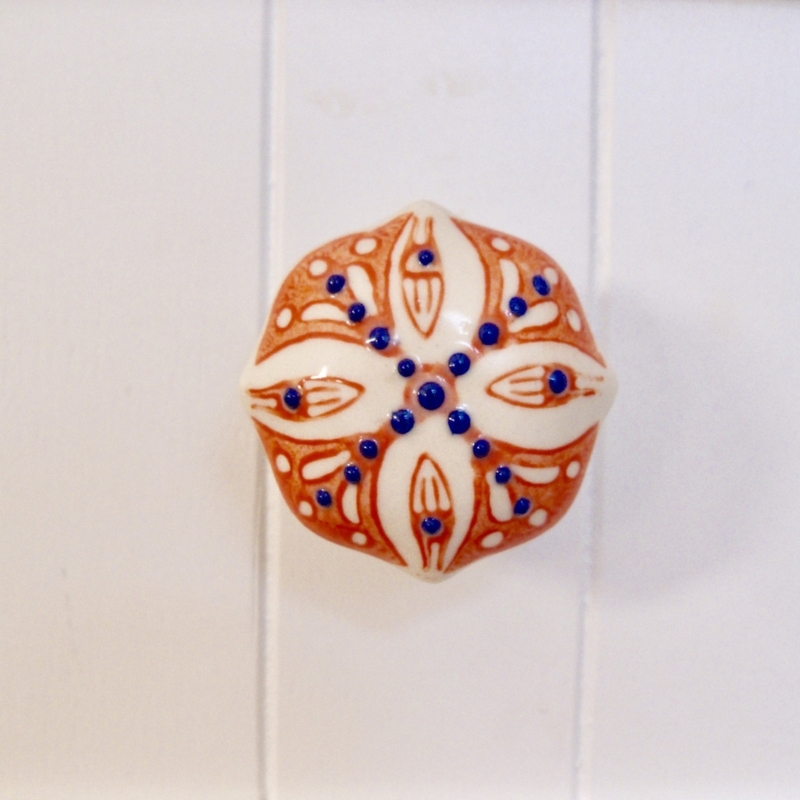 I also found these cute knobs whilst I was in there and added them to a simple white drawer unit which really lifts the whole piece, making it look far richer. Rightly or wrongly, I like having a TV in the bedroom. I know some of you will hate the idea but what can I say, I get it from my Mother! A lazy Sunday morning in bed watching trashy TV or a cheesy movie takes some beating. I needed something for the TV to sit on but I still wanted it to look good in the room. This Dahlia chest from Swoon Editions fits that brief perfectly. I made a bit of a naughty handbag purchase in Chanel recently and this Camellia comes from the carrier bag and I just had to save it. I think it looks rather good covering the lock on the chest. Finally, yet another piece from Loaf. It really is an addiction! The Audrie chest looks great with the Coco bed and the general vibe of the room. This is the large size which has 3 little drawers across the top and 3 big, deep drawers. The drawers themselves are go back really far so you really can fit a lot in. There are added little catches to stop the drawer falling out when you open it - a really handy little touch. The curves run across all the pieces in the room which ties everything together really well, it's not about everything matching but the flow is important. In case you're wondering, the paint colour on the wall behind is Elephant's Breath from Farrow & Ball. I would love to hear from you if you have any recommendations for interiors pieces, general feedback or even a suggestion on things you would like to read about, do leave me a comment below or get in touch.